It's the the million dollar views that make our gated community so special at WindSwept! It's the way Cherokee Lake can turn from sky blue to a mirror of gold. It's the timeless beauty of the Cumberland Mountains and the Great Smoky Mountains beyond that surround our spectacular waterfront peninsula. Explore this abundance of natural beauty on our walking trails. Cast off from our covered boat slips to enjoy the miles of clean, clear water. Indulge in the romantic elegance of our Manor House. Enjoy the charm of small town living. Then, add no state income tax, a temperate climate and you'll discover WindSwept really is an affordable waterfront paradise in the mountains of Eastern Tennessee. Welcome Home! 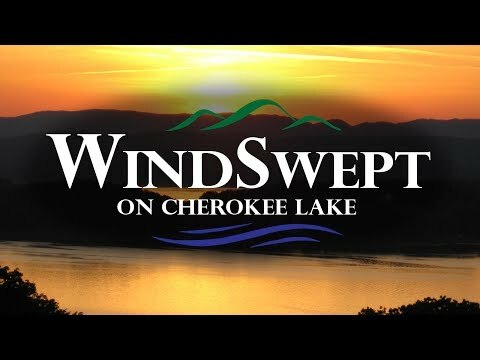 With it's 50 mile length and 30,000 acres of clean, clear water, Cherokee Lake is a water lover's paradise. Enjoy the "Hometown Feel" and cosmopolitan flair of historic Morristown, Tennessee just minutes away. Tennessee is ranked as the second lowest cost of living in the United States! Access to 9 regional medical centers, 4 institutions of higher learning, and a full range of national retailers all available in and around the Morristown area. Jim and Connie Poe move into their new WindSwept home! WindSwept Owners Christmas Party on December 14 at the Manor House!